10 Gb (40 Gb/100 Gb) OM4 Multimode fiber optic patch cables are 50 micron diameter for the actual glass core. With the cladding layer, they are 125 micron, and with the buffer layer they are 250nm. The glass is a higher grade than normal 50/125 cables. You should ensure that you purchase patch cables that match the core of any other fibers already in your system. (Since OM4 cables have the same core size as OM3 cables, these cables are interchangeable.) 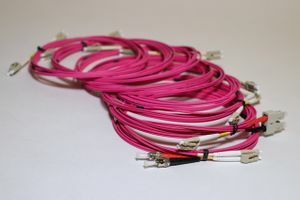 The PVC jacket of the OM4 multimode fiber is normally “Heather Violet” (also called “Erika Violet”) in color (although we can make them in other colors) and is 3.0mm in diameter for ST, SC, and FC connectors, but 2.0mm if the cable has an LC or MTRJ connector. We can also make these cables with a plenum jacket or a LSZH jacket, if required. The cables below are 50/125 glass and are classified as OM4 fiber, which means at 850nm (wavelength of the light source), they have a bandwidth of 3500 MHz-km, maximum attenuation of 2.3dB/km, and a typical maximum distance of 1km at 100 mbps and at 1000 mbps (1 Gbs), 550 meters at 10 Gbps, and 150 meters at 40 Gbps/100 Gbps. At a wavelength of 1300nm, they have a bandwidth of 500 MHz-km, max attenuation of 0.6dB/km, and typical max distance of 2km (at 100mbps), 600 meters (at 1000 mbps), and 300 meters (at 10 Gbps). The glass core of the OM4 cables is actually designed to a higher standard than OM3 which results in less speed difference between the fastest and slowest light path (mode) through the core. Since the multimode signal takes multiple paths through the glass, the less difference in timing when these signals reach the receiver creates a cleaner signal and allows the data to be sent longer distances. This difference in arrival times is called modal dispersion. These 50/125 fiber cables are optimized for 850nm light sources and 1 Gb, 10 Gb, or 40/100 Gb speeds. 40/100 Gb connections are actually composed of multiple fibers (4 or 10 each direction) each running 10 Gb to get the combined 40 or 100 GB throughput. Cable: OFNR riser rated, Violet, OM4, 2mm or 3mm OD.